The dress. Some of my favorite wedding stories stem from brides explaining how they knew their dress was the one. “I didn’t have the slightest bit of emotion during the dress finding process... everything looked lovely and honestly, I didn’t think I was going to have a “moment”. My dress wasn’t even on display, it was hanging in the back and I happened to see it. When I tried it on my eyes welled up. It was truly a “say yes to the dress” moment. Finding the right dress can be stressful, a full day event, or in my case one that happened when my Grandma pulled her wedding dress out of a suitcase. Jenny Does Weddings recently visited Ivory and Beau, a bridal boutique located just outside downtown Savannah, Georgia, and had the opportunity to meet the owners and spend time among sparkly, geometric, and fluffy pieces of art. 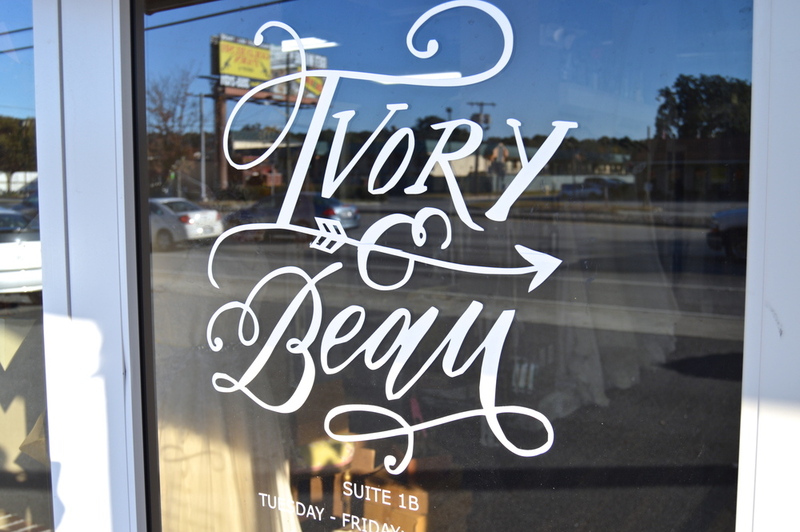 Adrienna and Nicole are at the head of Ivory and Beau, and welcome visitors from a front desk draped in sequins. Immediately, upon entering, I knew they were my kind of girls. Their style is eclectic, girly, rustic, and edgy with a touch of vintage, and the dresses lining their walls directly reflect that style. “We offer a lot of smaller scale designers, we love offering colors other than white, and do our best to partner with nontraditional bridal designers.” Co-owner Adrienna fully admits she is the more girly and glitter friendly of the duo, while Nicole tends to lean toward designers featuring geometric patterns and structural details. When asked who their favorite designers are right now, “Hayley Paige has great structural elements in her dresses,” Nicole mentioned while pulling out the tulle skirt with horsehair flounces. “I’m loving Sarah Seven’s designs, we have brides who will travel hours for her dresses,” Adrienna added. While their personal styles may be more bohemian than traditional, they have a wide range of styles and options available. I had my eyes on a few separate pieces that allow brides to pair a top with a skirt of their choosing, and the dresses that featured intricate beading along the shoulders and back. From simple and classic to a dress with a harness, Nicole and Adrienna are unafraid to bring in new silhouettes if they know brides are searching for it. I’ll admit, I am pretty happy I avoided the pain of trying on 8 heavy dresses while propped on a pedestal in front of my family and friends until the right ratio of tulle to lace landed on my body. But if my Grandma had thrown her dress away and I was left with nothing but my mother’s dress from the 1980’s, I would have been ecstatic to walk through the doors of Ivory and Beau and try on dresses until I knew I had found the dress. Want to plan a Savannah destination wedding? Contact Jenny Does Weddings to start planning the perfect day!